against the fire than ashes. begin to long for their meaning. sand beneath the weight of years. is a part of our action. the bark boat would capsize. the chain cannot be broken. and the goal is the beginning. are an unease that seeks rhythm. for which nature has not created any drink. From every field leap streams and springs. And the heavens overflow with holy rivers. for which nature has created no drink. At last I stand near the mountain of the fates. Shall I stay? Shall I go? The road lies dark. then no one will touch me. myself merely a lost eye. But if I go, if I go, then I shall know nothing more. I shall ride on coiling snakes of fire. I shall fly on winged wind-dragons. I shall fling myself forth dead or living, a fate future-heavy. Because they were never afflicted by purity. and your name among the cherubim. and there is nothing more to hide. How can I now be afraid? I shall never lose you. hurls its dark rejoicing out across the expanses. in floods of cosmic light. wash in wave upon wave through night-blue eternity. After all, the bud was cover all the winter. A stillness expanded, soft as sunny winter forests. How did my will grow sure and my way obedient to me? I carried in my hand an etched bowl of ringing glass. Then my foot became so cautious and will not stumble. Then my hand became so careful and will not tremble. You are the seed and I your soil. You lie in me and grow. You are the child expected. I am your mother now. all the life I have had. my love, it is you! I know: it is impossible. among things with unborn names. against my cheek and breathe undisturbed in your silence. born anew in closed darkness. I cleave a golden sea of honey that desires my hungry hands. You are going, and nothing of this have I given you. I never reached to where your being lies bare. that are washed away in water. Now I know how much you hid and kept silent about. But why have you hidden yourself so well from me? and to us justice be done. and not a grain of pollen is disturbed by light feet. broad-winged, that never let go of their prey. How would your tumult be in the sea’s spring storm? How would be your cry, when the sun annealed yellow eyes? Closed is the cave! Closed is the cave! the nerves of my innermost being. a song of living glass, of burning silver. where only one drop falls of the song from the leaves. It oozes out of the earth. There a tree suffers deeply in heavy layers of earth. the promise of fragrance of paradise miracles. that the crust cracks and yields up its prey? For the tree’s sake, have mercy! Or must we wait for a god – and which one? Our eyes are our fate. in a living, earthly way. and it has a right to everthing. ro rise from my grave. in the sea of loneliness. Then I must give thanks. what I know, what I remember. and yet it was forced on me. Why is my fate not private? Why can I not let it be? why is there torment there? when at last I am forced to dare? and was bowed down to the earth. I heard the darkness whine. were breathing by my side. and could not be quiet. with all my nerves snapped. that blossoms out of the dark. Merciless one with eyes that have never seen the dark! Liberator who with golden hammers breaks blocks of ice! nearer to you will their calyxes tremble. do they spread out their light-thirsty leaf-arms, devoted. to a walking swaying plant with heaven’s wind about his forehead. Yours is stalk and stem. Yours is my backbone. Not my life. Not my skin. Over the outer no gods dispose. you are there, when darkness swallows darkness. The rumbling rises. The night swells. Life shimmers so deeply precious. they seek powers to worship. torn by the winds’ strife. that seethes through the marrow. Too many times have I passed through the doorway. eternal winds in eternal spaces. and a will that is whole. let me through! I still have strength. take, but take to the last fragment. bar my way and cast me into the melting-oven. All is a door. All is a beginning. The axle of life is in your hands. that my happy hands do not blossom into heavy roses. there burns with quietly humming flames a deep, secret festival. of a human being’s eternally established trust. round my body, waiting here. comes the peace that waiting brings. I am free all the same. beyond all that destroys me. There is no happiness and unhappiness. There is only life and death. and will cease to repeat it when my will has ceased to be. we acquire until our death. meet with the sea’s giant laughter. Friends, what do you seek on the shore? twisted ghostly outlines are drawn. Around me float terrible mouths. The suburban train is thudding. to eat or be eaten. they lug their entrails in string bags. around a wet mushroom mouth. hides and denies his lips. God himself cannot see them. Why is he afraid of his lips? What do they look like when he is asleep? she who became a possessor. she is the one who prevailed. screwed tight around life’s prize. flowers a mouth that captures nothing. slash desperately at the others? Around you snap our deep-sea mouths. as primordial name aeons and aeons ago! in the fresh, cold swell. I starved on human words too easily told. I want to satisfy my mouth at my mother’s board. to the songs of my home. the speech of speech from a dull roar that never abates. to your resting depth of light that creates. and yet it is a human way, even so. and bar the way where you would climb. No flight can make you free at last. They appear again by new waysides. You have no choice. You must go past. and yet is a way of victory, even so. the same thirst for far-off things. and becomes a root and a mountain there. and yet has its goals and signposts, even so. Has its angels, in lightning dressed. and heavy chains become breezes and mist. and intimate light, that two acquire. he who has created life. when they bring milk in the evenings. is what depths give away. war and sudden, cruel death. for strength his penance to bear. despaired, and help they missed. more and more followed on. In the city’s midst stood a house. A staircase there led down. a man knelt in that hole. ‘The city is wealthy yet! Here a holy man lives and prays. Bitterly the old one laughed. ‘What is it you behold? and beyond that, nothing more? that ask for springtimes of pain! she fell and there lay dead. the daughters and sons of men. the holy man’s prayers rose again. Where did our eternity go? Our day became too short. and its essence is time. like a game and a loan. that no gauge ever nears. he soars with sorrowless heart, the sea-dark, sacred bird! The disintegration of the aesthetic ideals of classicism began when French symbolism embraced a new conception of beauty derived from a modern reality which existed at a great distance from harmony. Baudelaire claimed that beauty always consists of an eternal and immutable element. I would say of beauty that it is a dance on a knife-edge between the eternal and the mutable. A particular conception of wholeness has survived far away from the idea of classical harmony, but even in a work of art which signals splitting or the simultaneous presence of several instances, a perfection must make itself valid. Brightly shining, beauty still flowers, and this in spite of the fact that art no longer takes it upon itself to stand guard over traditional values. If emptiness is not to conceal itself behind beauty, and deadly tedium not to lurk behind the good and the true, these phenomena must today have dimensions that are at least miraculous. Of the beautiful Rilke says: Denn das Schöne ist nichts als des Schrecklichen Anfang, den wir noch grade ertragen… Here beauty is connected with terror, because the perfect is static and unchangeable, and as such is an expression of death. The terrifying and unendurable experience of beauty and terror in combination is fundamental to this century, in which the lack of beauty is no less than it was in Baudelaire’s time. If beauty has to meet an aesthetic need alone, it becomes slack, and the poetry narrow. The beauty lies in the formal devices poets use. Rilke’s angel is not beautiful, it is terrible, but the elegies are among the most beautiful things that one can read. And, like all beauty, they yield a resonance in the body. The art that encounters resistance or is reproached for being ugly will undoubtedly be accepted later, when the work’s innate beauty will come through in even the most far-reaching experiments. The new and the different are seldom experienced as beautiful – and certainly not that kind of art which struggles against order, the art that expresses disharmony, norm-breaking, illness, abnormality or annihilation. The conception of beauty is conditioned by a number of circumstances, including events in the field of science, e.g. in mathematics, the paradigm shift that has led to the revision of chaos theory. Just as chaos and order prove to be related, so beauty is unthinkable without its opposite. To yearn for pure beauty is to be two hundred years too late. The conversation with the classical works has changed meaning. What once they were, they are not today. They are, but they will always be something other, and yet they can preserve their intensity across historical time – a most important quality. At some points the connection is integration, at others a distance, but the dialogue never ceases to acquire a new character. The ‘old ones’ are interesting not because they are old, but for the simple reason that some of them are masters. What makes their works classics is not only that they are executed with artistic precision, but that they contain a universal value. They are still able to make an impression and set our minds ablaze, they still urge us to read and re-read them, and to reconsider them. New poetry that really wants to be challenging must take the poetry of earlier times seriously. The idea of a tabula rasa is an illusory one. All that we know, we know through language. Even our thoughts can never really be said to be our own. To a certain extent, therefore, tradition is already forced upon us. It would, moreover, be extremely foolish to try to ignore the past, or pretend to have lost our memory. Why not examine what the art that now exists looks like? Why not find out where it can be carried on from? For how otherwise is one to contribute something new and never seen before? An epoch is characterised at least as much by what it reads as by what it writes. The new does not consist in an overturning of the older poetry, in fact the new exists only by virtue of it. Ideas may take a rest and acquire topicality again, or with intervals of years may prove to be unexpected challenges. The question is not: what would my poems look like without a tradition? But: would they exist at all, had not poems been written before? For something to be able to call itself new, it must be new in relation to something else. If I want to seek the new, it will not happen unless I have first made discoveries in what has gone before, or at any rate the new will not allow itself to be embraced with a flight from the past. Knowledge of tradition is required if I want to step over that tradition and not run the risk of writing poems that have already been written. Only by acquiring an insight into the poetry of earlier times can I have any hope – starting from my personal universe – of continuing the aesthetic articulation that all art is. Every reading of the classical works adds new knowledge to what one already has. Thus one book is more than a book, it is a conscious multiplication, for the greatest works are born of many other readings and are therefore bearers of an insight and a memory at which no one would be able to arrive at, no matter how long they lived. The poet who has run out of ideals is finished. It is not a question of how far nowadays it is possible to reproduce older verse forms or rhetorical figures. Classical aesthetic ideals should not be abandoned, nor should they be sentimentalized, but only employed if they have a justification for it. A quest for original values can easily assume the character of compulsion or sterility – free access to the sources, on the other hand, is something quite different. When two ages confront each other, a further dimension may be added to the poem. 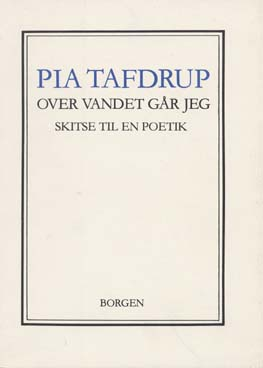 A number of traditional features still exist in poetry, fully deliberate, but they enter a new complexity, where the pulse is different and where, for example, the measure is taken of the peculiarly musical quality of the Danish language. To work one’s way into this field of tension is a challenge, a charged and condensed place to be. If people now talk so paradoxically about reinventing tradition, it is because the classics have lived a suppressed existence. It has long been the vogue to take a critical attitude, which in practice has meant that many have been so preoccupied with breaking tradition that they have not had much to do with it. Others have as a matter of course taken the classics into their intellectual orbit, quite simply because eminent works have been written before our own time. The reinvention expresses itself mainly as a rereading, but in some cases also as a rewriting. Dialectics in art arises in the field of tension between tradition and experiment. By all means call it modern to criticise the criticism that has set the modern works alone at the centre. The cultural context is that the works exist side by side: the new books and the classics. I live between the echo of the poems that went before, and the whispering and murmuring that is already being heard from poems that are still to be written. When my generation of poets were publishing their first collections, I quite often heard other poets muttering from the sidelines: is it really new, what they’re bringing out? But surely life, love, loss, longing, death and decay are subjects still worth writing about? Isn’t it the task of all human beings to discover for themselves the things that have always existed? No one can ever lay claim to the experiences of others. The only possible avenue of progress is to fight one’s own way forward. Could the resistance of those poets have had something to do with the fact that the thought the world and mankind were new? What is given is a supply of collective raw material from which I as a creative individual create the personal subject-matter of my poems. Alternatively, my subject-matter may simply be seen as part of a common stock of raw material. It is the same ontology and possibly also the same attention-radius, but my focus is another, my contexts and interpretations are different, as their existential context takes the form of a specific era in history. And again: my poems are coloured by my nature and temperament. The modern should not be viewed as the loss of a past. On the other hand, however, one can may hunt about in the modern in order to see what existed in the past. In the modern it survives in a new and unexpected form. For no idea that is brought into the world ever leaves it again. Something can be forgotten, but then reappear and be reactivated. Books influence one another, but the notion that one great common work is being written is a utopia. The idea is a clever one, but it implies a united, shared perspective that is no longer applicable to our time. On the other hand: now and then I am seized by the mad idea that the planet is kept floating in space, constantly rotating and held aloft by all of us writers… As long as we write in the remembrance of the origins of our unique position. In art, revolution inevitably leads to classicism, as Mandelstam put it. The books that have meant the most to me? The Bible, the Anatomical Atlas and the Dictionary of the Danish Language. when I awake all this shall be yours! − when I awake all this shall be yours! and jasper – dear friends! And when he dies his training is complete. one day of shifting light. stops, considers the autumn sky. and no one is following him. or wash them with a light that will endure? or be read by no one? the first morning breeze came and broke the mirroring water. where your cry is not heard. nor reality with God’s dream. without you yourself being transformed? Do not seek in the mute grass, seek the mute grass. the day that goes miraculous because it never returns. they will remember who now dream? among the dark trees where they stand, unmoving. under the trees’ crowns, under the open, boundlessly open gaze of heaven’s eye. stood the dead reeds by chill water. and walked away through the wood without seeing us. her road was lost in the wood. Then we heard the reeds before the wind reached us. your image is reflected in the window. carriages that were ordered for your death. that sway in the darkness? clawlike stretch across the human mind. their song new spaces arch and vault. brush near the sleeping one who bears your name. a darkness lasts, falls, lifts and falls. of the world like a grass, of the grass’s star. least miracles of the miraculous day. before the hedgehog’s snout and the shadows. like the stones by the shore. cleaner than words, with morning water. what the word cannot say and what the bay says. as if the roads of childhood were closed by the darkness. in your other, remains of the earth that was you and belonged to the darkness. as a bird, a bird you will see, never more. in your confirmed soul or the dark December. as long as the day’s shadows do not rest. from the earth to which I seek my way. took the objects from me, returned them to me in absence. The leavetaking birds stretched into silence. has vanished in the mountain. He shouts no more. You see yourself, perhaps, but cannot hear his voice. Perhaps you cannot see him in the summer darkness either. His mother shouts for him. Now all the flowers stand frail with frost. and someone who already awaits his image printed in the mountain’s side. calling his voice to mind. is cool as the coolness in your limbs. Infinitesimal is the weight of the ripening years. into the forest that has come to an end and put out its fires. when the cool wind returned. scarcely a murmur from the cool blood. the silent, heavy, wonderfully young. You have arrived, the morning’s boat is here. The years buzz like bumble-bees in the summer warmth. or like the image of the trees. where islands rest on water-levels of the hand. then their voices became one voice. Short is the time when we may live. a door open for the night’s breeze. like a blood-red leaf from death’s tree. and only the miraculous song, silence. over your life rests its dust with the savour of disappearance. Already for you the murmur of springtimes is past. and not been touched by snow. and extend those shadows that are swordlike aimed. but a sound in the grass. when the children play in the grass. a grass that will constantly grow. the bay is moved gently by winds. Clear, without stars, is the sky. an image of the chill sea opened. when already new days had arrived, other voices were heard. and we parts of the stillness, the lingering mind. until the wind is silent. the islands wander and the clouds. I love that which cannot be chosen. not evening, not break of day. in order from two words to win back one. he saw the play of their hide in the summer light. The darkness in their eyes absorbed June’s greenness. as though he had frightened them with his certainty. the use and clarity of things. in the wound that never closes. over eyelids and the night’s vigil. and like your words in coolness lingers. Where have you been, you who were well-known? the winds run through his limbs. The one that has sung grows silent. ever more distant flock of birds. but move above the fields like a heraldic bird. flakes whirl through the naked days. grow still in a wintry circle where formerly wild the song was sealed. and the life you live is, compared to this night, short. With wings the light spreads in the June greenness. the water over the bursting deeps. The child walks through the grass. and enclose him in darkness. heavier than life and with its knowledge. the autumn draws near and sees my eye. is perhaps the place where silence was born. are silently leaving my landscape. a table, a mountain, a tree. Thus days go, clear without consolation. The landscape must be transformed. and the leaves on the trees become bronze. that divides your world from the world. You throw yourself over it like one in despair. with the sound of death. the light. We rest beneath its vault. in another Umbria, in the shadows. that has held out against the changing of the light. The day soon tall and the grass tall by the road. in Eras del Lugar valley. reminds me of way back when I was so angry about everything. so my anger-satellites sparkled in all the heavens. the desert sky. On the horizon I think a little anger-satellite is blinking. Most wonderfully lovely pomegranate tree. where many pomegranate trees grow. where the Alhambra palace is. I got lost in the Alhambra. in the Alhambra’s secret chamber. a man’s presence in the thick darkness. and whispered my secret to him. a rare sight in November. La hora de la verdad. My poetry comes into being between two poles: between hunger for life and fear of death, between excitement and thought, language and silence. The process is never the same, but – stretched quivering between extreme points – it contains a compelling necessity which seldom allows itself to be explained in any other way than: I can do nothing else, so I must do it. Before the poem, a restlessness arises: spontaneous, unreflected and completely irrational phases, in which unknown energies are at work. Sleepless nights and convulsions, momentary irritation, melancholy, aggression and other conflict-ridden states. Seldom is it a harmonious situation that releases the poem. Very important, before the restlessness, a position of waiting, and endless patience. This period may last a long time, but may also be decisive in its invisibility. Associated with the patience is a humility, which is perhaps the real beginning? The phase of pre-articulation with its different stages may easily be undervalued or quite simply overlooked, but what happens here is crucial as to whether the amorphous state will be released in a poem. Or: there are seldom poems without this phase, for what is involved is a degree of attention that is almost intolerable. It may be short or long, be scarcely perceptible, but it is here that there is an openness for anything that wants to find its way under an irritable layer of skin, here that sudden plunges under the surface of thought take place. Only afterwards does it become clear that the restlessness was the beginning of something new that was on its way. The state of pre-articulation may have so strong a grip that when I do eventually write, I no longer have any sense that it is me. Like an anaesthesia, an intoxication. Someone else or someone else in me, something else or something else in me acts, while I look on. Something that is more than me, or something that also exists in me,writes. What happens cannot be explained – thence the dizziness, but it is a question of reaching that point in the process where one forgets one’s own personality and is able to eliminate the private. on devrait dire: On me pense. An attempt to take the direct route to the representative will only lead to poems that are vague. Only when the personal sets itself out over the private can the general emerge. It is not our emotions but the patterns we create from our emotions that are the essential thing, as T.S. Eliot pointed out. I say: the angel dwells on the other side of subjectivity. A man once said to me at an exhibition, where we were looking at paintings from the eighteenth and nineteenth centuries: ‘Your body is so classical. As I look at these pictures, I can recognize it everywhere.’ What he meant by this inverted declaration of love was: these studies of the body contain all human beings – or at least a half of mankind, all women. An artistic representation of the body is more than the individual body, it’s an expression of the body’s essence. The poem must likewise be more than the writing subject. It is the movement inwards that leads past the subjective and towards the universal, like Jung’s ideas about the collective unconscious. There exists an expectation of the general place that poetry must reach, but at the same time the poem exists by virtue of its specific character. If it doesn’t smell of skin, what use is it? There can never be talk of art unless the private material is worked over and even the darkest events or most shocking experiences transformed into light. The poem has no value of its own until I leave it. It must be possible for it to be read independently of my individuality, which means that I must not be present as a private person. The partial must not oppress the universal. The poem only becomes real to the reader when it is possible for the reader to enter into a relationship with it. The fact that I must never lock the poem does not mean that it is only valid if it has breadth: it’s better to reach a few people and affect them deeply than to reach many only superficially. Universality and breadth are two categories that are qualitatively different. Inspiration is an invasion of forces that reach far beyond what is generally known, both physically and mentally. I have seen violent, almost superhuman energies manifest themselves in people shortly before they died. Although those people were ill and drained of strength, they were suddenly able to perform huge physical tasks such as the moving of objects that are normally immovable. In its own way, inspiration is likewise an overwhelming physical transformation. It can also have certain points of equivalence with the most searing love, with sorrow or fear, but unlike these instances, the energy is channelled into something else. Whether the forces that break forth arise from within or from outside cannot be ascertained. Sometimes the possession lasts a few seconds, at other times it’s a question of long intervals. Something wants out, but why through me? And why do I want this something out? Sometimes what I try to summon fails to turn up. Instead something unexpected arrives. The process always contains an element of the miraculous. I am not an instrument for something, but the place where this something can grow. In that state I may have the experience of the poems writing me. In the moment of inspiration I don’t only see further and more clearly than usual, but also differently and LIGHT-awake. This state exposes the microscopically small extent of what is normally seen and perceived. But to open the mind in the dimension that is part of inspiration is something that can only be done for a short space of time. The Romantics and their successors maintained that inspiration is the making visible of a whole. I would say: if not a whole, then at least a glimpsed connection between things that normally appear to be separate. The Romantics were able to set their sights on an order that was already given. The task today is, for a moment, to create order in chaos, for no whole is any longer apparent. I can adopt a seeking stance, or try to summon something forth, which is the same thing. If inspiration is to be present, what is involved is a sharpened attention, a special way of living. I write because I cannot help it. Either through fate or unwittingly, I have spent my whole life preparing for this. I am seen. So there is no way back. Either I go out of myself and let myself be swallowed up by the alien other, or I receive the alien other into myself. The first movement dominates mostly in childhood and youth, the second in adult life. The ideal is to be able to do both, and what is involved is of course only a spiritual dimension. To devote oneself to the world is a precondition for being able to create a world. I receive the world into me at the same time as I exist in the world, and I produce a world at the same time as I exist in the midst of the world. In all talk of aesthetics, the birth of the poem is a principal consideration. Writing about how a poem announces itself is very different from what happens when a poem appears. In addition, each poem has its own subtle history, which complicates the whole matter further. It is only afterwards that the reflections are of interest. Why did I do this and not that? Only by standing outside the process can it be described. On the one hand I may have the sense that the whole thing – or at any rate part of it – was already there before the poem itself came into being, it was just that I couldn’ t see it. As though the words were simply waiting to be brought forth. On the other hand, I was the person who put these words together, who gained mastery of new images which I will understand only later, or will never really know where they came from, for that happens too. I have written poems I actually did not understand, or where the process of their becoming visible was unexplained: the sense that something had suddenly been given, something I had to continue on my own. überwältigtest sie: aber nun kennst du sie nicht. These lines could be about any of the poems I’ve written since the angel broke its silence. For it was in that first book of mine that I discovered poems need not refer directly to something that is already familiar. One of the paths in that first volume is built of poems which are based on familiar material, but as poems they’re not interesting, because the aesthetic manoeuvring in them usually blocks new perception. The other path is the one I subsequently followed and took as my starting-point in many directions — the one that involves a surprise, the momentary quiver of something that hasn’t been seen before: why did I suddenly write this, and where did it come from? It’s about trying to do more than what one thinks is possible, about hurling oneself out into the most challenging places. It’s in those places that one has the sense of fear and being overwhelmed, the sense that anything may happen, but it sometimes happens in a region where one almost cannot bear to be. I don’t know who whispers the words, and I don’t always know what is being whispered, only that the words announce themselves in order to be written down. I write without inquiring. It is always too late to turn round. There is nothing to hold on to except what already exists in myself, and what is thrown over me in waves as I write. The poet’s work is linked with an ability to lose himself, to temporarily set himself outside society and history. The writing of poems is a matter of authenticity, of forgetting about other things and other people. And of being oneself, with all that this requires. There are situations where for a moment the material takes control of the writer. And if the control is not won back, one goes insane. Or worse: risks death. The sensuous and the emotional are not enough to create a poem. At most a diary. It was only when I read Edgar Allan Poe that I realized the degree to which self-restraint and a methodical approach are involved in the poetic principle. The fire must be met with cold. These lines express a modern approach that jettisons quite a few myths, as there is a widespread belief that poems only come into being in a state of intoxication, madness or headlong ecstasy. I’m especially familiar with the enabling energy that is a first step in the process, but at some point self-oblivion and direct outreach must be replaced by a very high level of self-awareness. Poe’s method is to set certain goals for himself in advance. That is why there is so little mention of intuition in his writings. I doubt that he is right in what he says about spontaneity. At any rate, I don’t have an explanation for every device I have used. Although I like the idea that an essential part of the process is a dispassionate overview, not everything in the process can be explained. Strictness and wildness are irreconcilable dimensions that must be reconciled in the process of writing. The precondition for writing poems is to be able to rise, let the dream move one’s body. My best writing times have always been accompanied by dreams of flying, in countless variations. I can stay in the air for ages, and can travel in this foreign element without any trouble at all. Writing is a longing for the present, a longing to be allowed to exist. It is about being captured, daring to devote oneself to opposites. Pleasure and pain mingle together, and there is no more damming-up of the words that flow out ineluctably. Writing poems is above all being in the present tense, while also simultaneously being aware of other times and tenses. At times when the moon and the stars are especially favourable, everything points to what is being written. The work on a book is not very different from falling in love. I am sensitive and receptive in a new way. Things that are apparently indifferent can’t avoid having significance asctibed to them, and coincidences arise between the strangest phenomena. Words are – at least temporarily – in chaos. What before were chance events now become signs. In absorption things change. Most often it is a slow process, in which only small details alter. At other times there is an overwhelming vitality, and suddenly something shockingly new and unexpected is on the paper, something that now and then anticipates what I will develop years later. What forms the beginning of a poem often ends up being deleted, either because the poem grows, and overshadows the beginning, or because the starting-point is possibly too private. Only when whatever it was that gave rise to the poem has been crossed out does something that is worthwhile begin. The process of the poem belongs to the moments when I think: that is why I am alive… On the other hand I also know the dread of beginning, because there are periods of writing when I must enter places that are full of dread. The poem is brought into the world and is thereafter, in principle, accessible an infinite number of times, while I become aware of my own mortality, but also of the fact that with each poem I am left with a remnant, that after the poem I am also confronted with something that could not be written into it. The poem stands there shining, and every time I will be whirled into places from which I must drag myself, empty and exhausted, back to the same darkness, the same inarticulate sphere. Once the poem begins, there is only one thing for it: to give up everything else and hurl oneself into what is taking place, without compromise. A process has begun. It can go only one way, and that is forward. Neither life nor poem nor society permit any slowing down. It is essential to be able to endure prolonged uncertainty and doubt, as a poem will never allow itself to be forced. Creation is not the possession of all the wisdom in the world, but the ability to be constantly born. ‘I am not yet born, but bearing am redeemed,’ Sophus Claussen says. Sometimes I cannot gain access to the receptive space where I can forget everything, and the poem can be given birth, where I can form a shell around myself and be at peace. I may try to do so from many angles, but I will not succeed in finding the entrance to the room I know is there. The process of the poem is a being-alone-with-oneself. Something that was not there before and contains a new being in itself, appears. Or the process may begin almost imperceptibly with a sound, a rhythm, a musical motif, a fragment of something almost forgotten or a misreading. Even the experience of absence may set language in motion. A modern physicist would say that atoms have always existed, that something has always been given. Something is there, but whatever it is, it can be extremely diffuse. There exists a material, an amorphous structure, which by means of transformation is brought to take on a number of forms, but most importantly: poems are not created from nothing. Something is. Just as at birth we have the impressions of nine months already behind us. The thing that was the poem’s original starting-point, and is often discarded, exists nonetheless as an invisible place, and has its special function in the poem. While the draft of the poem is coming into being, I feel that I have been put outside of time, although that phase has its beginning and its end. The place I am in is forgotten, as is my identity. A state of seeking, almost weightless. Like a pure floating. “Storm and stress” is often considered a virtue, but stands in contrast to meditation or absorption. If I am absorbed by the outside world all creation is rendered impossible, because in that case it is the world that uses me to act. In the process of the poem precisely the opposite becomes true: it is I who am the agent. A bombardment of impressions may be sometimes be of importance, but in the phase of writing the direction goes from inside to out. All the handwritten revisions, the basic sensuous experience of moving a pencil or pen across the paper are incredibly important, as are the subsequent fair copies, because they have the character of being finished, and therefore call for corrections and improvements in a way that is different from the first hasty sketches. A rationalization of the process would not produce more good poems — at most, it would give rise to a great many bad ones. Between the individual sketches hours, days or weeks, sometimes months may lie. One can’t bully a poem, or it locks up and will not obey. Where a poem is concerned, it is not the writing down that takes time. On the other hand, the intervals between the productive phases can be of long duration. But during the time that the poem is resting, something happens. Or I am given new eyes to see with. The material or the emotions may pile up, ideas and images grow out of proportion, the potential may assume dimensions which cannot possibly be of any benefit. There is nothing to be done except to overcome one’s resistance and carry on. Poems demand will, a fact that conflicts, perhaps, with many an old myth, but the poem does not come into being with the wave of a magic wand. In a society, the will is one of the most invisible things – there it is always the finished result that counts, or the final product that is presented. But will, which is not to be confused with mechanical toil, apparently exists on a perfectly equal footing with other instincts, and should not be undervalued. Will and endurance may go very far in determining my fate, but they are not sufficient to create art. At most, these forces are a forward operating base. Lastly, the exertion must not be detectable in the finished work. ‘It’s from diamonds like yours that I know the sweat they are silent about!’ Per Højholt writes in The Moon’s Gesture. A Sophus Claussen Identification. Anyone can experience inspiration, but few have the courage and discipline to go further. It is above all here that the artist stands out from others, who let happy ideas evaporate the instant they are born. It is the stubbornness that is enigmatic, like the will to life. Where does the strength to go on have its source? At the times when I am preoccupied with a poem, I cannot be the person I would like to be. I wound and offend, I demand the impossible, or do things I later regret. I can see what I am doing, but cannot act differently. All my strength moves in one direction: towards the poem. All my passion is gathered in one single point. Perhaps the poem needs me? The poem ‘Meditation Fountain’ in Bridge of Seconds speaks of two forces that are present at every birth, a gathering and a spreading. Creation and destruction are aspects of the same process, and so destruction is an important element in art. Nothing comes into being without something else simultaneously being destroyed. Rejection and precision are deeply interconnected. There is a paradox in the sense of being enriched after deleting, word by word, the thing that at one stage one tried to persuade oneself was a poem. It’s a happy experience to have written a good poem, but at least as happy a one to have avoided writing a bad poem..
Where does the poem open? It opens where the unknown starts. If I only write about familiar material, I limit myself and present an obstacle to all the things that could be written meanwhile. New perceptions must always be able to come up behind me, impulses that bring me to an unpredictable place. A poem must close. It has its own end built in to it, but must at the same time point beyond itself. It is only when the definitive move is made that the ending becomes visible. In what the definitive consists cannot be said, as each poem has its own move, which points towards closing. While it is far from invariably possible to explain what started a poem, the decisive move can as a rule be made clear during or immediately after the work. Later it is probably forgotten, but the fact remains that beginning and the end must be in a supple relation to each other. A poem can be so short that it does not manage to develop, but can on the other hand run the risk of being so long that it loses precision or becomes diffuse. A poem must stop in a convincing way, so that it can start in the reader. The title of a poem functions as an orientation point. I don’t remember numbers, they don’t tell me anything. Number-blind, I stumble about in the dark. But a title is important, because the poem is recalled by it. On the other hand, titles should not signal too much. They should be more in the way of hints than titles which make the poem top-heavy. It’s a relief when a title gives itself, for usually it is the title that causes the greatest difficulties. This is especially true of book titles, which ought to be a miniature of the whole work. The strange thing about book titles is that they converse with one another. The title I gave my first book has had direct consequences for the others. Like names in a group of brothers and sisters. Visible or invisible poles exist in my poems, but the number three is the magic one. It hides everywhere in their composition, and in the books’ inner conversation. Springtide and White Fever constitute two poles, while Bridge of Seconds became the third quantity, which could not have been devised without the preceding ones. Viewed like this, the three works are related to one another as thesis – antithesis – synthesis. The poem ‘Moving sculpture’ in Bridge of Seconds is a hidden poetics for the three books mentioned here: King, Queen and dauphin. The dauphin is an unexpected result, which again must mark off a new figure which lies outside the material that is given. A continuous dynamic praxis. The figure three also plays on another motif. The poems do not merely articulate an I-you relation, a poet-reader relation: a third instance is present between the two. In the poem the limits of the unsayable are investigated. Not everything must be made visible, for when the mystery vanishes, obviousness and the one-dimensional begin. A poem’s mystery should not be exchanged for a hard shell of something unapproachable, nor with unnecessary mysticism or chronic sentimentality. The hermetic, which alone shuts the poet in and keeps the reader out, is not desirable, but on one level poetry is always an oracular monologic discourse: the possible transformations of expression, all the many layers and structures that demand repeated readings. A good poem has an inborn character that calls for movement and continually steers towards greater understanding. Where art is concerned I do not doubt for a moment that fidelity is a necessity. It is not imposed on me. I choose it myself as the only valid way of relating to poetry. It is a precondition in all seeking for a true artistic language, it is the condition for creation that steps beyond itself. Fidelity is an openness that obliges, but also a risk, for with it I stake everything. After the poem: a violent exhaustion, but also an inexpressible relief that this something has found its way out. For a time, a great happiness… Or a hibernation-like state sets in, a physical condition in which all sense-impressions glance off or are neglected. If there was an element of something that growled like a beast of prey in the pre-articulation phase, now the beast scratches behind its ear again. The condensed energy or trembling nervous state that exists before the words appear returns again for a time after the poem. I find myself indeed in a place of whose existence I could not possibly have had any idea before the poem, but am again hurled into fear and darkness, once again alone with what is greatest. The insightful poet must be able to parody himself. What decides if the poem is a successful poem? Time.